The before picture above shows how this bathroom needed some updating. The client wanted a grown up feel for the bathroom that was functional as well. A Glass Shower enclosure with a pivoting door, large 12 x 24 floor tiles and a large mirror help to make this tiny bathroom feel spacious. 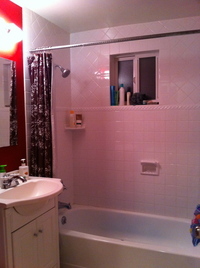 This tiny bathroom was transformed and feels much larger after the remodel.